This is a quick fix dip for game watching or card playing. It's tart and goes well the pretzel rods. It's not bad with the Fritos, either. Sauté the onions in the butter over medium-low heat until soft, about 10 minutes. Serve with pretzel rods, pretzel crisps, or Fritos Scoops. I use the food processor to chop the pickles and the onions. I use Hamburger Dills for this recipe. 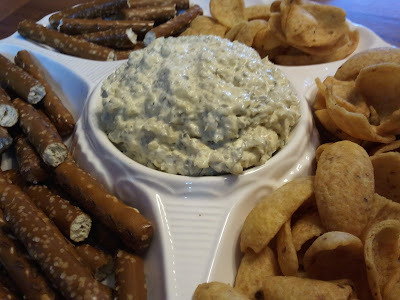 I serve this dip with pretzel rods and Fritos Scoops.